On Tuesday (1/15), the British House of Commons rejected by an overwhelming margin – 432 against, 202 for – the motion to accept the withdrawal agreement and political declaration about the future relationship that Prime Minister Theresa May’s government negotiated with the European Union. Commentators seeking to characterize the defeat found themselves using words such as “historic” and “crushing.” It was both of those and more – the largest margin of defeat ever inflicted on a sitting government. 118 of the 314 Conservatives eligible to vote – the speaker, deputy speakers and tellers don’t vote – rejected the deal, as did all but three of the 251 Labour M.P.s, the 35 Scottish National Party M.P.s, the 11 Liberal Democrat M.P.s, the 10 Democratic Unionist Party of Northern Ireland M.P.s, the four Plaid Cymru M.P.s, the Green M.P., and five independents. 196 Conservative M.P.s voted in favor of the deal, along with the three Labour M.P.s and three independents. The margin of defeat – 230 votes – was substantially more than well-informed observers were predicting only hours before the vote. There were undoubtedly a number of issues that caused the 118 Conservatives to vote against the deal. But one above all stood out – the Irish “backstop,” the provisions in the 173-page Protocol on Ireland/Northern Ireland that is part of the 585-page binding withdrawal agreement that are intended to ensure that, in all future circumstances, the border between Northern Ireland and the Republic remains, as it is today, open and frictionless. On Dec. 10, Theresa May announced in the House that, in view of the fact that the agreement, scheduled for a vote the next day, would be defeated by a significant margin, the government was deferring the vote and would, in the meantime, seek “further reassurances” from the EU in regard to the “backstop.” At the meeting of the European Council three days later, the leaders of the other 27 member states underscored the fact that the “backstop” is intended as an “insurance policy to prevent a hard border on the island of Ireland” but said they were determined to work speedily on a subsequent agreement that would establish by Dec. 31, 2020, the termination date of the transition period during which the UK would remain in the EU’s Single Market and Customs Union, alternative arrangements so the “backstop” would not have to be triggered. Toward that end, the EU27 said they were ready to embark on preparations for negotiation of the future relationship immediately after signature of the withdrawal agreement so the negotiation could start immediately after the UK’s withdrawal. The leaders underscored the fact that, if the “backstop” was triggered, it would apply only temporarily, until it was superseded by a subsequent agreement that ensured avoidance of a hard border. And they said that if it was triggered, the EU would use its “best endeavors” to negotiate and conclude “expeditiously” a subsequent agreement to replace it. On Dec. 17, in informing the House that the debate on the withdrawal agreement would resume in the week of Jan. 7 with the vote taking place in the following week, the prime minister said she would seek “further assurances” from the EU in regard to the “backstop.” Five weeks went by without any further assurances until this past Monday, the day before the vote, when the EU and 10 Downing Street announced an exchange of letters dated Jan. 14. In their letter to the prime minister, Donald Tusk, the European Council president, and Jean-Claude Juncker, the European Commission president, made it clear they could not agree to anything that would change or would be inconsistent with the withdrawal agreement. But after reiterating what the European Council said in December, they said that its conclusions have a “legal value in the Union commensurate to the authority of the European Council under the Treaties” to define directions and priorities for the EU at the highest level and, in the specific context of withdrawal, to establish, in the form of guidelines, its framework. The Commission confirmed the EU doesn’t wish to see the “backstop” enter into force and is determined to replace it by a subsequent agreement. It also confirmed the shared understanding that the withdrawal agreement and protocol don’t affect or supersede the provisions of the 1998 Good Friday or Belfast Agreement, don’t extend regulatory alignment with EU law in Northern Ireland beyond what is strictly necessary to avoid a hard border, and don’t prevent the UK from facilitating the participation of Northern Ireland Executive representatives in the Joint Committee that would oversee the agreement and the committees and working groups that would deal with matters pertaining to Northern Ireland. The presidents also confirmed that any new act that the EU proposes adding to the protocol will require the agreement of the UK. They said that, given their joint commitment to use their “best endeavors” to conclude before the end of 2020 a subsequent agreement which supersedes the Protocol, they would give priority in their work to discussion of proposals that might replace the “backstop” with alternative arrangements, including “facilitative arrangements and technologies.” And they acknowledged that the parties could, as provided in Article 132, extend the transition period to Dec. 31, 2021 or Dec. 31, 2022. Needless to say, judging by the Tuesday’s vote, those “assurances” changed no minds. Indeed, if anything, they persuaded even more Conservative M.P.s to oppose the agreement than had opposed it five weeks earlier when Theresa May had deferred the vote, if only because the EU made it clear innumerable times over those five weeks that the negotiation of the withdrawal agreement couldn’t be, and wouldn’t be, reopened and the “backstop” couldn’t be time-limited. The prime minister’s first instinct will probably be to return to the EU and seek, yet again, “further assurances.” Perhaps now that the UK has actually rejected the agreement, she’ll be more successful in obtaining assurances that change the minds of enough of the M.P.s opposed to the deal to enable it to win approval. In several previous cases – after Danish voters had rejected the Treaty on European Union in 1992, after Dutch voters had rejected the Association Agreement with Ukraine in 2016, and after the parliament of the Belgian region of Wallonie had refused to approve the UK-Canada Comprehensive Economic and Trade Agreement in 2016 – the EU provided meaningful assurances – in the Danish case a European Council decision (not a conclusion) providing it with various opt-outs from the TEU, in the Dutch case a declaration making it clear that the Association Agreement with Ukraine didn’t create a pathway to membership, in the CETA case a legally-binding Joint Interpretative Instrument setting out the parties’ shared understanding about controversial provisions – that enabled each to approve the agreement. But the magnitude of the defeat may dissuade the EU from offering any further assurances; it may conclude, given the negligible effects of the Dec. 13 conclusions of the leaders of the EU27 and the Tusk-Juncker letter, that at this point there’s nothing more it can do that would transform a defeat of that magnitude into a victory. Indeed, short of reopening the negotiation and explicitly limiting the duration of the “backstop” or, alternatively, changing Article 132 to remove any limitation on the duration of the transition period so the “backstop” would never have to take effect, there probably is nothing the EU can do at this point to change enough votes to win approval of the withdrawal agreement. And given the magnitude of the defeat on Tuesday, even doing that may not be enough. In the immediate aftermath of Tuesday’s vote, the prime minister announced that if Jeremy Corbyn, the Leader of the Opposition, tabled a motion of no confidence, the government would debate it on Wednesday. Corbyn tabled the motion and on Wednesday, in a reversal of the previous evening’s crushing defeat, the House rejected the motion, albeit only by a very narrow margin – 325 to 306. All 314 voting Conservative M.P.s voted against it, joined by those of the DUP and one other M.P; all of the others voted in favor. 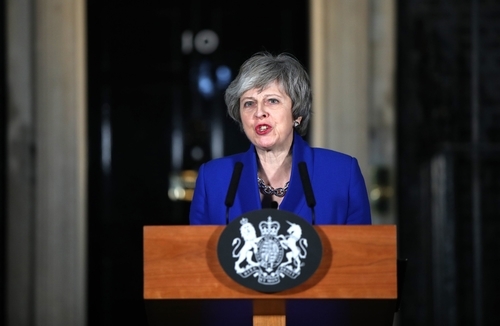 Immediately after the vote, the prime minister said she will continue to work on delivering the result preferred by voters in the 2016 referendum and, toward that end, said she would meet with party leaders and senior parliamentarians beginning Wednesday evening. More than anything else, the magnitude of the defeat reflected the fact that Theresa May’s Conservative Party doesn’t command a majority in either the electorate or the parliament. It won 42 percent of the vote in the 2017 election and, notwithstanding the advantages enjoyed by the largest parties in the UK’s first-past-the-post electoral system, it governs as a minority government – one that is further constrained, especially in regard to the Irish border issue, by its reliance on the DUP for support in Parliament through a “confidence and supply” arrangement. And as if it were not difficult enough for a minority government to persuade a majority in the House to support an agreement shaped by its “red lines,” both the Conservative Party and the government are themselves deeply divided over the agreement. In retrospect, it’s hardly surprising that a minority government constituted by a party that is deeply divided about Brexit and that announced its “red lines” for a withdrawal agreement long before it knew what kind of future relationship it wanted and primarily in order to quell internal dissent within the party would have great difficulty in persuading a majority in the House to accept the agreement it negotiated. If there ever was a time and place when a broad cross-party coalition government was needed to ensure negotiation of an agreement that would command support across a broad spectrum of the public and by a majority in the Parliament, it was the UK after the 2016 referendum. In her comments after the motion of no confidence was defeated, the prime minister appeared to recognize for the first time the need to speak with and work with the other parties and their leaders in deciding how to respond to the defeat of the withdrawal agreement and, specifically, how to resolve the apparent deadlock among the various options now before the government and the House – whether to go back to Brussels for more assurances, or call upon the EU to reopen the negotiation of the withdrawal agreement, or request an extension of the negotiating period beyond March 29 (something that would require unanimous agreement by the EU 27), or revoke the UK’s Article 50 notification of its intention to withdraw (something the European Court of Justice ruled in December could be done), or call a second referendum to determine what the British public wants, or call a new election (something that, under the Fixed-term Parliaments Act 2011, would require either a two-thirds majority in the House or a vote of no confidence in the government and no confirmation of an alternative government within 14 days). It’s not at all clear which of these options, if any, would be supported by a majority in the House. But one thing seems clear: None of the party leaders and very few M.P.s, apart from a small number of hardline Brexiters, prefer a no-deal exit on March 29 to all of the other alternatives and, indeed, all of the other party leaders made that clear in their initial public comments and, in some cases, conversations with the prime minister Wednesday evening. Jeremy Corbyn, the leader of the Labour Party, in declining her invitation to meet, said he wouldn’t speak with her until the government rules out a no-deal exit. Ian Blackford, the leader of the Scottish National Party, called on the prime minister, as a gesture of good faith, to agree that an extension of the negotiation beyond March 29, a second referendum, and rejection of a no-deal exit will be on the table in any discussions. Sir Vince Cable of the Liberal Democrats likewise said a no-deal exit has to be taken off the table and a second referendum should be considered. Speaking after Wednesday’s motion of no confidence had been rejected, Theresa May announced that, in accord with two amendments put forward by Dominic Grieve, a pro-Remain, pro-second referendum Conservative M.P. and former Attorney General – one in early December, the other when debate on the agreement resumed on Jan. 9– and adopted over the opposition of the government, she will table an amendable motion on Monday, Jan. 21, setting out how the government proposes to proceed. Depending on what she proposes, amendments may be proposed calling upon the EU to reopen the withdrawal negotiation, calling for the Irish “backstop” to be time-limited, calling for the negotiating period to be extended beyond March 29, calling for revocation of the UK’s notification of its intention to withdraw, and/or calling for a second referendum. Hopefully, for the sake of the British and European economies, there will also be an amendment that stipulates that the UK will not leave the EU on March 29 or later without a withdrawal agreement that has been approved by Parliament. Meanwhile, the Article 50 clock is ticking, and time is running out.